"ADOL" ltd. has property rights for 9 trademarks: "
"GJERGJ KASTRIOTI Sk�nderbeu" Cognac (design and words) AL/M/1993/, Registration No: 2-45-2. COGNAC - SPECIAL" (design and words) AL/M/04/00104, Registration No:10318 and AL/M/04/00105, Registration No: 10319. F�RNET "ADOL"( design and words) AL/M/04/00101, Registration No: 10315. "F�RNET "ADOL" - SPECIAL"( design and words) AL/M/04/00100, Registration No: 10314. "Raki Moskat" "ADOL" (design and words)AL/M/04/00102, Registration No:10316. "PON� PORTOKALLI "ADOL"( design and words) AL/M/04/00103, Registration No: 10317. 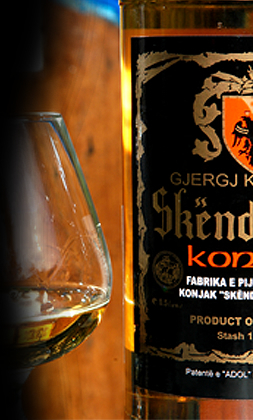 "Gergj Kastrioti Skenderbeu"(words) AL/M/2000/00256, Registration No: 8148 for class 33: Cognac. "ADOL" ltd. is the owner of the patent for the production of "Gjergj Kastrioti Sk�nderbeu" cognac: AL-P-1994-00036 and of the patent �Alcoholic beverage and the process of its production": AL-P-2000- 00126. "ADOL" ltd.is certified by the World Intelectual Property Organisation (WIPO) for the trade mark of "GJERGJ KASTRIOTI SKENDERBEU". Countries where the trademark protection is extended (d�signations selon): Bosnia-Herzegovina, Bulgaria, China, Croatia, Cuba, Macedonia, Federation of Russia, Monaco, R.P.Democratic of Korea, Romania, Serbia & Montenegro, Switzerland, Ukraine, Australia, European Community, U.S.A, Japan, Norway, Republic of Korea, Singapore, Turkey. "ADOL" ltd. has property rights for trademark and patent for cognac "Gjergj Kastrioti Sk�nderbeu".